Security is currently the number one priority for everyone and the use of video surveillance is not restricted only to protecting people and assets. Escalating security concerns and the recent spate in terrorist activities have forced governments around the world to invest in video surveillance technologies for homeland security. This has significantly boosted the growth of the global video surveillance market. However, applications of video surveillance are not restricted to homeland security alone and include the domains of banking, transportation, education, retail, and healthcare as well. There have been significant advances in the field of video surveillance systems over the last decade. The advent of digital systems has made it easier and systematic to store and retrieve of data as opposed to watching hours of video tapes. The video surveillance industry is growing rapidly not only in terms of technological advances, but also adoption in new applications sectors. Video surveillance systems have made beeline into a variety of application sectors such as education, banking, retail, transportation. With the advent of globalization, businesses have expanded and also spread to overseas locations. As a result, surveillance systems are now also being used for real-time and remote supervision. Asia-Pacific offers a lucrative market to video surveillance players. This can be attributed to the developing countries such as India, China. The video surveillance market is experiencing a shift from analog to IP and the players of this market are focusing on developing new products. An IP video surveillance system enables real time monitoring of the desired location remotely. The monitoring from several different cameras can be done through a single location. The picture quality offered by IP video surveillance system is superior than the one offered by analog system. The use of IP surveillance systems also helps in saving the operational and infrastructural cost incurred in installation of a video surveillance system. Traditional analog cameras are expensive to install, owing to the requirement of coaxial cables, power source. On the other hand, digital cameras can be powered using Power over Ethernet (PoE) that supplies power to a camera by means of the same cable that is used for network connectivity; thereby eliminating the need for power outlets at the camera locations. Some of the key players in this market include Axis Communications (Sweden), Pelco (U.S.), Mobotix (Germany), Sony (Japan), Bosch Security Systems (Germany), Cisco (U.S.), Milestone (Denmark) and ONSSI (U.S.), among the others. Mobile video surveillance is another fast growing segment of the video surveillance market. The mobile video surveillance system can be both analog and IP. This market comprises surveillance equipment being installed in vehicles, and trains. The mobile video surveillance market is being driven by the increasing cases of crimes in school buses, trains, and public buses, which amount to a loss of millions of dollars. Some of the major players in the mobile video surveillance market include March Networks (Canada), Safety Vision LLC (U.S.), and Iveda Solutions, (U.S.). This report provides a detailed analysis of the markets for all the components of a video surveillance system, such as video cameras, video analytics, storage, and servers. The report’s strategic section sketches the competitive scenario in the video surveillance market. 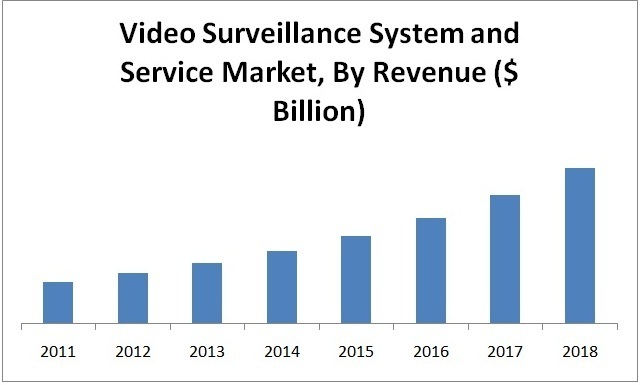 The video surveillance market is in the growth phase and is expected to grow from $11.5 billion in 2008 to $37.7 billion in 2015 at a CAGR of 20.4% from 2010 to 2015. Cameras, storage, servers, and software are the main components of the video surveillance systems. There has been a significant beef up in security around the globe post 9/11. Governments across the globe have been investing loads of funds for the development of reliable and robust security systems to counter the advanced systems being used by various terrorist outfits. Video surveillance is one of the solutions to monitor and deter dangerous and nefarious activities. The fast growing video surveillance market is being driven not only by the heightened need for public security, but also due to private security concerns; in addition to a technology shift. The security industry is converging with information technology, marked by a gradual transition to IP-based video surveillance systems. IP video surveillance enables cost effective monitoring with both-local and remote locations being checked with a large number of cameras being managed on a single network. The emergence of video analytics has further enhanced the monitoring capabilities of such systems by adding intelligence to the devices and the network. Wireless systems can also help reduce the cost and complexity of deploying such systems in harsh and remote environments. The video surveillance market is experiencing a transition from analog to IP and it is expected that by 2015 IP surveillance systems will take over the conventional analog surveillance systems. In terms of applications, education sector is expected to be the fastest growing amongst all the other applications. 9.2 AGENT VIDEO INTELLIGENCE INC.